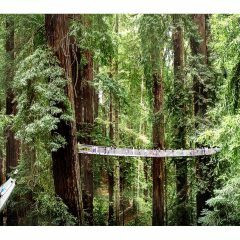 The City of Eureka and the Sequoia Park Zoo Foundation invite the community to a public meeting to learn more about our upcoming Redwood Canopy Walk project. We hope you will join us Sunday, January 27th, 2019 from 2:00 PM–4:00 PM at the Wharfinger Building for a presentation on this innovative project that will be opening at the Sequoia Park Zoo in 2020. Short presentations from our design collaborators Synergo and Tree Solutions Inc. will provide the audience with some of the conceptual planning done thus far, as well as safety and technical considerations, safeguards for forest health, and descriptions of the visitor experience. Photo Attached: Artistic renderings of Redwood Canopy Walk courtesy of Greenway Partners.